This exhibition at the Y.U. 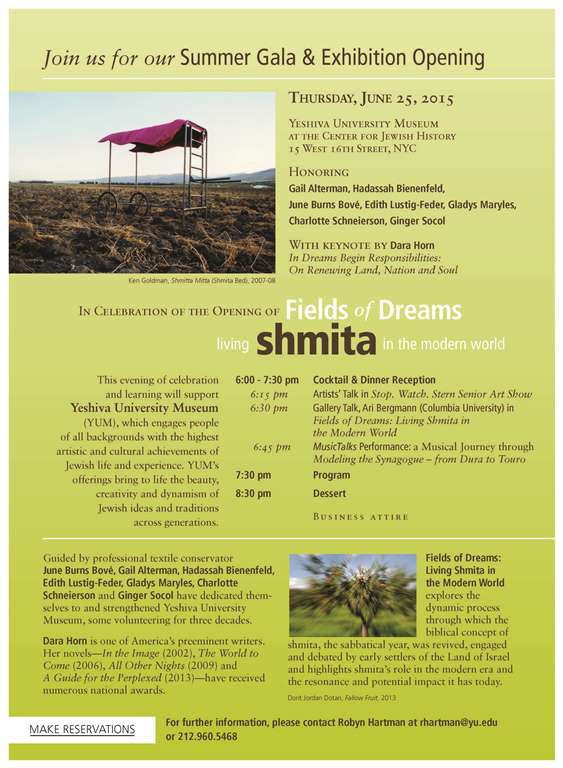 Museum explores the dynamic process through which the Biblical concept of Shmita was revived, debated and engaged by early settlers of the Land of Israel. The exhibition features rare, original documents and letters by the most significant rabbinic voices of the late 19th and 20th century, as well as by contemporary photographs, artifacts and works of art that demonstrate the resonance and impact of this ancient custom today. June 7, 2015 – December 27, 2015. The contemporary artworks in the exhibit are by five Jewish Art Salon members. 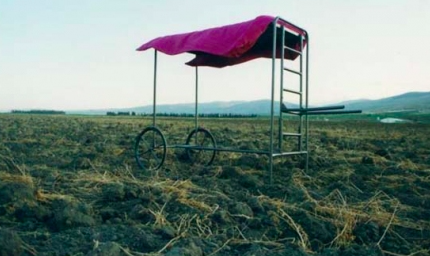 Ken Goldman in his work “Shmitta Mittah” documents his performance, an attempt to dramatically revive the idea of rest throughout the Shmitta year on his home, Kibbutz Shluchot, in Israel. For this performance he created a wheeled rickshaw-like bed that he dragged from field to field. He would sleep in the fields and invite people to call his cell phone and chat as he was resting on his portable bed. 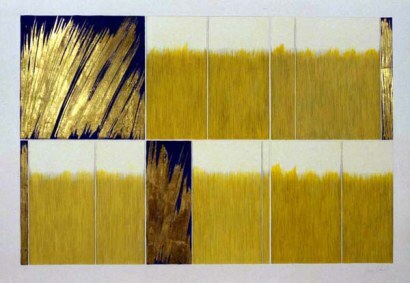 Susan Schwalb‘s abstract works “Intervals” evoke fields of wheat or corn juxtaposed with gold leaf strokes. “This series of works arecomprised of 2 or more squares, and is involved with issues that have concerned the artist for a long time: contrasting a free, and spontaneous section with a controlled.and carefully drawn image.Schwalb is obsessed by the extraordinarily sensuous line of silverpoint, and has been since 1974. This Renaissance drawing technique with a stylus of sterling silver marks a specially prepared surface in her current work, an acrylicgesso ground. She uses thousands of fine lines to obtainan luminous surface in each picture. 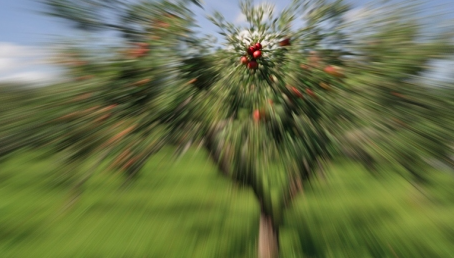 Dorit Jordan Dotan‘s “Fallow Fruit” is about experiencing Shmita as a medium for both personal and societal transformation. Ellen Holtzblatt‘s four paintings are all part of her series, “Morning”, inspired by the morning prayer service. In these works she contrasts nature with the footprints left by people. 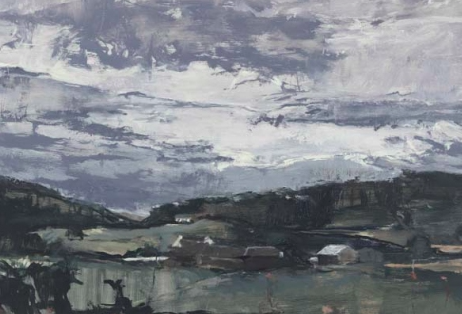 Through her paintings she seeks to feel the blood in the earth and the soul of human presence. 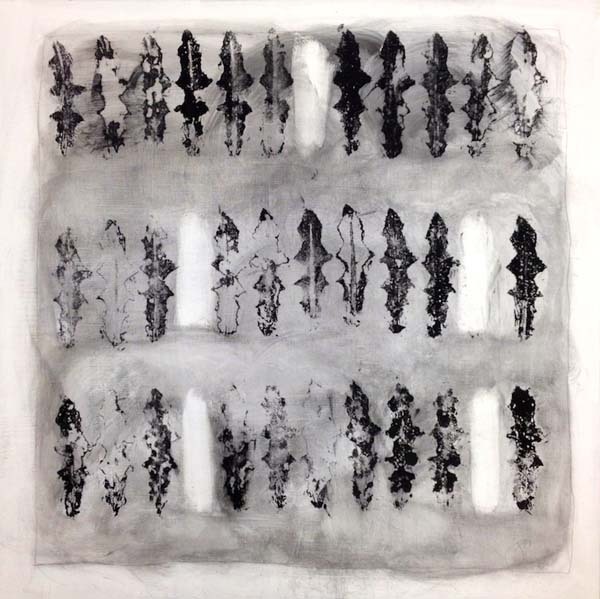 Jan Ayers Friedman uses found and reclaimed materials as tools for monoprinting. For “Fallow”, depicting the agricultural aspect of shmitta, it was important to her to use an actual plant leaf to create the imagery. A dandelion in the community garden behind the studio served the purpose. When the result was finished, she discovered that the motif of ‘six leaves and void’ conveyed the shmitta principle, and also eerily resembled figures among tombstones. Her response to this was to consider the entire shmitta concept in a much deeper way – continuing and sharing a journey of understanding. Sunday, Tuesday, Thursday: 11:00am – 5:00pm. Monday: 5:00pm – 8:00pm. (free). Wednesday: 11:00am – 8:00pm. Friday: 11:00am – 2:30pm.